1. Block 1: Stacks #02 and #03 and Block 3: stack #11 are directly facing the Bin Centre. Usually, these stacks/units should be a last resort. Especially lower floor units are to be avoided "like the plague". 2. Although Stack 01 is not directly facing the Bin Centre, side glance will still see the Bin Centre. 3. Low floors close to marking in pink "A" may be affected by both the noise from the rubbish collecting truck and smell from the truck as well during the unloading of the rubbish into the truck. 4. Surrounding locations at marking "B" is less likely. 4.1 Unless due to some circumstances that the rubbish truck(s) did not come to load up rubbish - such as maybe during Chinese New Year. 4.2 Or if there situtations where distinct odours such as the thrown away durian husks etc.. or even a rare "strike" by the rubbish collection persons? 4.3 This senario is very unlikely in SGP. As it is a crime to do so. LOL. 3. Although there is no scientific proof of the ill effects from staying near-by to an ESS. 4. However, there is a well-known stigma attached to this. 4.1. Thus, even if technically there is no issue; why go against "the flow?" 4.2 Just follow the crowd and give these stacks / units a miss and avoid carrying a baggage in the future. Such as in the event of re-selling the unit. 1. The first time that comes into an experience home owner's mind when they see the word kids is "noisy". 2. 1. Heaven Luck or born with. This can be analysed by the system of Ba Zi. Here, one can check the suitability of one's career choice. 2.2. Earth Luck or Feng Shui of your home and workplace. This involves a host of things lke career luck, family luck, health and overall wealth of the place one stay and/work. 2.3. Human or man luck. This includes personal ability and relationships and personal abilities and able to pick up a skill etc..
3. Each of the above account for 33.33% of the total luck = 100%. 4. There are some who simply cannot tolerate noisy sounds coming from a kid's play area. 5. Given that many condo units have a balcony. This balcony actually helps to futher magnify or bounce "up" the noise from the play ground or kids' pool area. 6. This "white pollution" or noise pollution comes under the Human or man luck factor. And if one does not feel good with this, then it can affect one's luck also. 9. Often I have heard "noisy" play even at very high floors of a unit facing such a facility. 1. Major expressways like the PIE is another consideration. 2. This is just a sample. 3. Althought the architects have done a reasonable job placing both the Recreational Tennis Court and Sports Court as well as Rock Climbing wall and Garden playground. However, especially Block 57 stacks 196, 197 and 198 are most affected still by the traffic on the busy PIE. 4. Yes, in general, one can say that noisy situation can affect both the Feng Shui and also Human/man luck as explained under earlier Para 2 (above). To the North of Singapore is a huge land mass of Peninsula Malaysia. 1. The wind direction for this development is either North to South or South to North depending on the time of day + high and low pressure zones. 2. 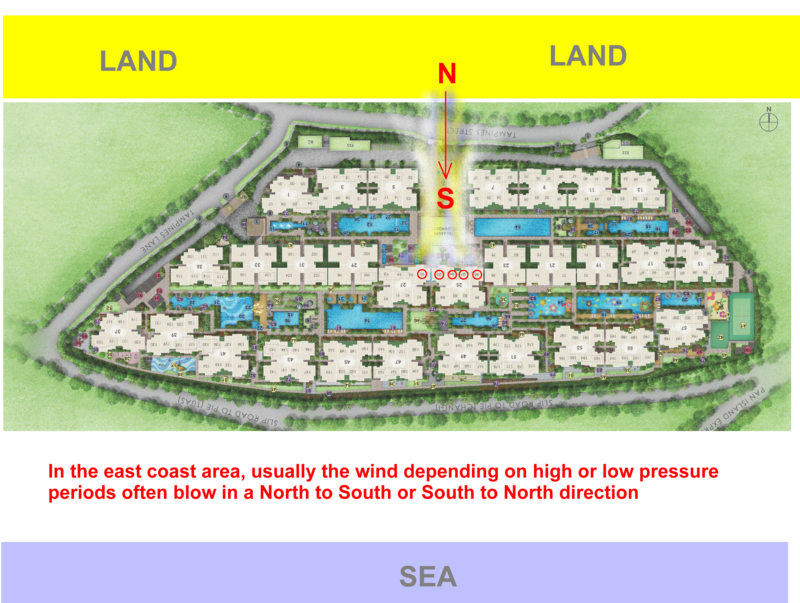 A major part to play in this is the sea which is directly at the South of this development. 3. Here, often, at night the land mass located in land i.e. Treasure at Tampines usually has low pressure. And often at night, the wind will come from the sea with is the East Coast or South of the development. 4. During the day, (unless there are expected to be rainfall) often the sea has low pressure. Thus wind from the North will flow downwards towards the "sea". 5. In the event where winds try to flow South. 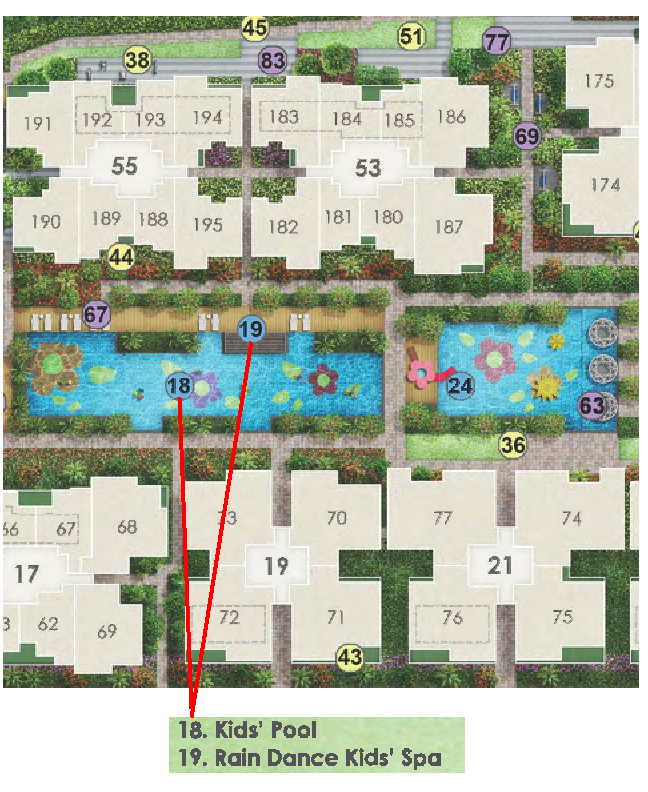 In this development, especially at the area as shown in the illustration, it forms a bottleneck and forces it's way towards Blocks 25: 85, 86, 87 & 88 & Block 27 96. 6. What this means that on certain days / time of day there can be "forceful wind" blowing towards the frontage of some or all of these blocks. 7. If so, this is considered a Sha Qi or too much wind is literally no good for the occupants of the units. 8. Too much wind can affect both Health and wealth of those staying there. 9. Thus, depending on wind or windy conditions: the occupants can either have very good luck (constant gentle winds) or forceful winds. 10. Therefore, if the forceful winds are not controlled e.g. keeping certain windows closed etc.. it can be unlucky for these occupants. 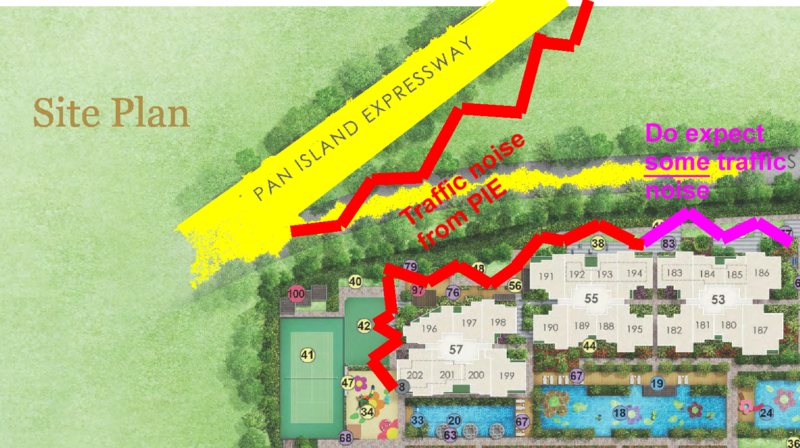 Part 5: Traffic noise from service road within Treasure at Tampines. Block 15 with stacks #57, #58 & #59 = One of the two entry/exits into the basement car park. Block 37 with stacks #117, #118 & #119 = One of the two entry/exits into the basement car park. 1. Some of the key considerations is the location of the common bins. 2. Where possible, avoid the common bin next to the unit's main door or facing it's main door. 3. Get your respective Agent to help you obtain a copy of the common lobby layout. To find out the exact common bin and to ensure that it is away from the unit. 2. Under Shapes and Forms Feng Shui the plus is that all blocks are orderly aligned in a North-South direction. 3. Minimising as many poison arrows from the sharp corners of neighbouring blocks/stacks. 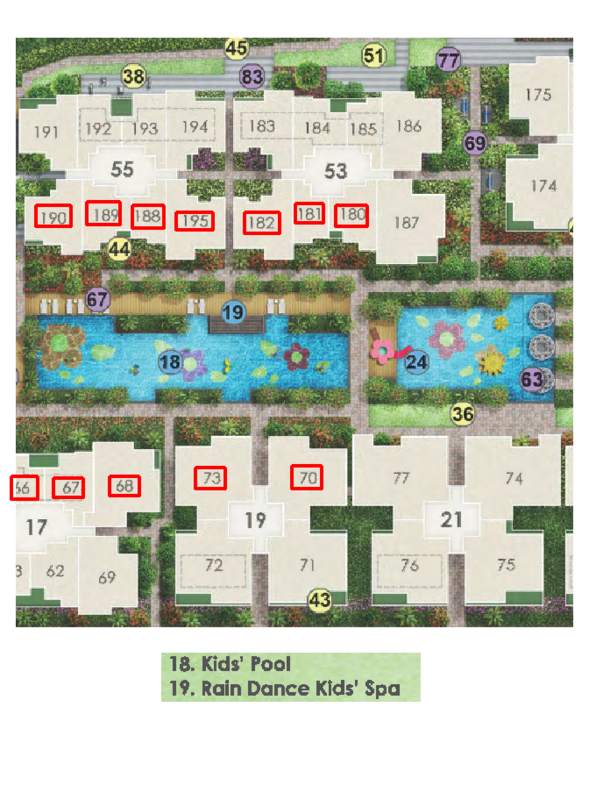 Developer: "Jane, for your information, the Onsen Spa Pool is located between stacks #71 and #72..."
Jane: "Sir, Can I get my grand mother from Japan to check it's authenticity? For example, are you using New water or Sembawang spring water?" 6. 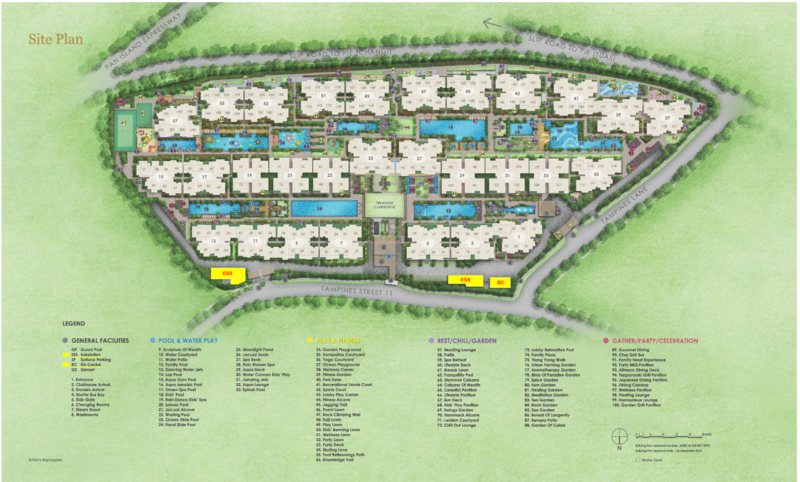 It is thus not difficult to visualise South facing stacks and try to locate stacks with kitchen at NW sector. Especially Flying Stars S2 facing ones. 7. Does Fire at Heaven's Gate affects everybody? Spread the word. Don't let them profiteer and get away with it. 1.1. If the balcony is not considered while the Yard and utility are actually (in BLUE) protrusions, this layout is close to a perfect rectangular shape. 2.1. Good that the WC's, sink and plumbing are back to back in Baths 2 and 3. Minimising the drainage pipes for this one unit. 2.2. Bath 1 shares the same wall as the built in wardrope of Bedroom 5. So long as one does not remove this wardrope and sleep on the floor next to the shared wall of the WC is good. 3. Seems like the bigger unit has it's own rubbish chute. Still need to check whether the main entrance of the unit is close-by or facing any common bins (if any) since the smaller units shares a common bin. 4. Another "nice-touch" is to have a separate yard especially for the placement of the washing machine. (And an optional top loading dryer - if any). 4.2. Even if liquid detergent is used, and if one use high heat e.g. 60 degrees or more to wash and/or dry the clothes .. there may be moisture from the washing machine depositing it's power onto areas around the kitchen. 4.2.1. Of course, the food will certainly taste "better". So does - if prolonged may (touch-wood) lead to cancer. As the powdery substance will be all over the open air plates, bowls, utensils etc.. in the kitchen. 5. Another nice-touch is the "partition" made up of the DB box etc.. shielding the main entrance door from the kitchen. 6. Although the stove shares the same wall as Bath 3; fortunately, especially the WC/sink is not on the same wall with it. 7. 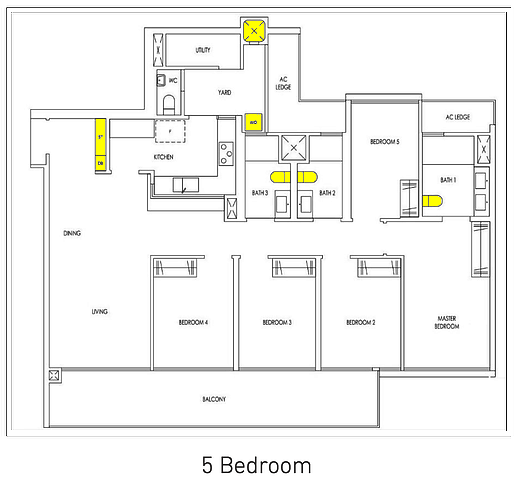 Overall, this means that this specific layout can be considered as "Feng Shui Friendly". (Other than looking at personalised Feng Shui of the individual occupants. 1. Shapes and Forms Feng Shui favours a rectangular home. 2. Other developments should also try to emulate two toilets in a perfect mirror of each other: for the developer this means less materials costs and for the occupants means less in-flow and out-flow pipes plus less maintenance (in the future). 3. For a 2 bedroom, can understand or cannot be helped that there is space for a service yard to house the washing machine. 4. Before signing on the dotted line, do ask your respective Agent to show you the common corridor layout plan to properly ascertain that the common bin is not beside the unit or directly facing it. Part 11: In the early 1966's Treasures at Tampines is suppose to be within the Changi estate. 1. Good news that in the 1966's Treasure at Tampines sits on an undeveloped part of Changi. 2. Back then, the more pronounced development is to the South of Treasure at Tampines; East Coast of Singapore and later Bedok. 4. Then in the early 1980's many at that time consider Tampines less convenient as it is "far". Today, we know or would have laughed at this. Given that there are the Woodlands/ Marsiling estates which are literally the furthest to the Central Business District in the South. If so, Tampines estate does not seem that far off today! 2. The only difference is that when 2024 arrives; one should still plot a Period 8 chart. But take into consideration the wealth stars under Period 9. 2.1 In the event that T.O.P. occurs on or after 2024 then in theory Period 9 chart should be considered. Other considerations may include when one moved-in. 3.1 In the past each unit was entitled to 1 to 1 car park lots. 3.2 However, in the 2012 period, condos like Treasure Trove was allowed to have around 70% car parks to the total number of units, there. 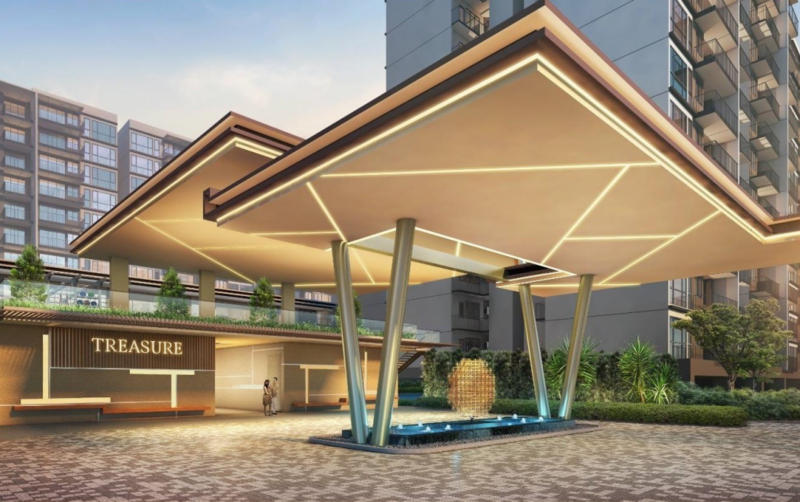 As it was believed that this development was close to Punggol MRT / LRT station. Thus there will be those that do not need to own a vehicle. 4. For Treasure at Tampines. This works to be 80% of car park lots for the total units, here. 5. More likely if the car park is full in the future; balloting may occur if all units each have one or more vehicles. 1. It is good that the developer has again separated the washing machine and placed it in the yard: away from the cooking/sink area. 2. Under Shapes and Forms Feng Shui and Symbolism in Feng Shui: Standing at the main door e.g. at marking in blue A not to be able to see into the kitchen area. As most don't always close the kitchen door all the time. 3. Thus it is considered favourable that the kitchen entrance is set-back further by placing the ELCB power switch allowing only to be at position: "B" then can see into the kitchen / sink area. 4. No issue. Just that if one has a maid, avoid her head sharing the same wall as the stove. Stack #89 has two poison arrows: one aimed at opposite stack #164 and #173. Stack #92 has a poison arrow aimed towards #150. 3. Please note this is just a sampling exercise. And not a complete overview of all poison arrows in this development. 4. At this moment it is hard to say whether the poison arrow is aimed towards any openings or not. 5. If the poison arrow(s) is aimed towards a bedroom window, then often a day curtain can be drawn most of the time. The premise: "If cannot see, no longer a threat, applies". 6. But if the poison arrow is aimed towards a unit's balcony; unless one always and fully draw an external day curtain or zip track blind; otherwise, harder to cure as it is not possible to close the balcony sliding panels everything. Sample Option 1: Can or Cannot Buy? 1. This is not a major issue. As it can easily be remedied easiler. And the remedy is a simple no hassle "cure". 2. However, do wait until one meets some Feng Shui practitioners. Who have asked their clients to place "funny" things above both bedroom doors. LOL! How much is your selection fee. Thanks!